This is the debut album from Finnish Black metal one-man outfit Vargrav. Interestingly, V-Khaoz (yes! ), the only member of Vargrav, has not released anything under this moniker before. Typically, bands take a little time in the releasing of Eps, demos, splits, etc. to form their sound, but not good old Khaoz. Nope, his first release is a galaxy hopping, mind-melting 43 minutes of black metal bliss. The overall sound of the album is very atmospheric, without falling into the Atmoblack category. One is continually washed in beautiful layers of textural guitars, pounding drums, and tasteful keys, all while vocals just barely float somewhere in the mix. Layers is a key term here: there are many of them. Remember that seven-layer salad your mom used to make? With the onion frizzles and mayo? This album has more layers than that, and they’re even tastier (also less likely to provoke a heart attack). I generally am not a huge fan of keys on any metal album. It is too easy for keyboards to sound cheesy, out of place, or too “light” and happy to keep up with the dark atmosphere of most metal. Black metal is the only subgenre in which I can generally stand a lot of keyboard presence, and they still have to be very well-done. Netherstorm absolutely nails the perfect balance of keys and guitars. I would argue that keys are just as important—if not more so—as the guitars on this album, and somehow that’s a good thing. Almost every song begins with an epic and eerie keyboard intro. They remind me of The Pagemaster, the under-appreciated 90’s Macaulay Culkin joint. And before you get all up in arms and say “Aaron, how can keys that sound like an under-appreciated 90’s Macaulay Culkin Joint be good?” just trust me, they’re good. They build a more effective atmosphere than most albums I hear. Often it is difficult to even distinguish whether what you are hearing is a guitar or a keyboard because everything kind of melds together into a whole. That could seem like a knock on the production, but it’s not. Though things can tend to get mixed up and become muddy, it adds to the ambiance and the feeling that one is voyaging through ethereal space. The vocals suffer the most from this, being placed wayyyy in the back of the mix, so if you’re the type to need upfront vocals, you may be upset. All the instrumental performances are good, despite the keys stealing the show. Drumming (whether programmed or live I’m not sure, though they sound believably real) is inventive and enjoyable. The low end gets a little lost in the mix, but cymbals are bright and clear as are snares. Khaoz mixes things up well between blast beats, off-kilter cymbal beats, and powerful tom-based rhythms. Guitar riffs tow the line between chord-based textures and single string tremolo runs and consistently impress. There are also more guitar effects than you can shake a stick at, which is part of what makes them so hard to discern from the keys. Flangers, phasers, and a whole mess of reverb are utilized very well to create many otherworldly guitar sounds. The best part of the instrumental performance is how well everything works together. Other than keys, nothing here is utterly spectacular, but when they are all combined, they become more than the sum of their parts. The best encapsulation of the synergy between instruments might be the penultimate track, “Obedient, Intolerant, Ensnared,” which manages to sound eerie, interstellar, epic, and emotional all at once, without losing the core sound of black metal. This album will take you on a journey through blackest space, floating past stars and constellations, all the while banging your head. Highly recommended, excellent black metal. *Note that the vinyl comes with a bonus disc featuring two bonus tracks, another Vargrav original and an Emperor cover. 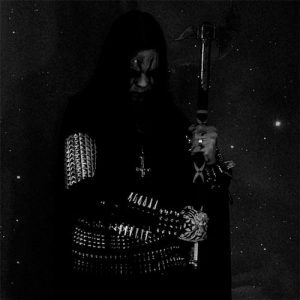 This entry was posted in Black Metal, Reviews and tagged atmospheric, black, black metal, featured, Finnish Black Metal, keyboard, Netherstorm, Vargrav.